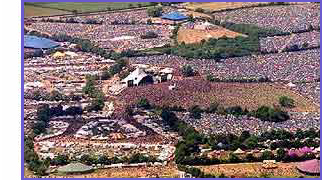 In a year's time we'll be making our way to Glastonbury Festival. Hopefully the weather is as it has been this week so nice and dry with lots of sun. We should start getting some details about ticket sales soonish, and the line-up should start serious rumours from the autumn onwards. So yes, be a wee bit sad but we're over the main hump which is the week of what would have been the festival. It's all runup to 2019 from now on.